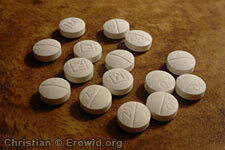 Methylphenidate is a central nervous system stimulant widely prescribed to treat attention deficit disorder. It is also used in the treatment of narcolepsy, mild depression, and in combination with other drugs in the treatment of chronic pain. How much amphetamine is in a tablet marked "alza 36"? What can you tell me about Focalin?